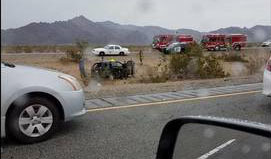 Blythe, California—Three people were seriously injured in a two-car accident on eastbound Interstate 10, just west of Mesa Road in Blythe. The crash closed I-10 just after 12:30 p.m. on Friday. Accident investigators would not speculate as to the cause of the collision which left one of the vehicles overturned. Law enforcement officials initially reported that a pregnant woman, an infant and another person were seriously injured. Three helicopters were summoned to the scene to air-evacuate the victims to nearby hospitals. The infant was flown to a children’s hospital in Arizona. Later, the pregnant woman’s condition was downgraded to moderate injuries. Names of the injured parties were not released. We wish them swift and complete recoveries.